SOLD #780 IL THIS FRONT SLIDE MILLENNIUM EDITION WANDERLODGE HAS BEEN GARAGED AND IS IN VERY GOOD CONDITION INSIDE AND OUT! Reduced to $105,000. Motivated seller will listen to offer! 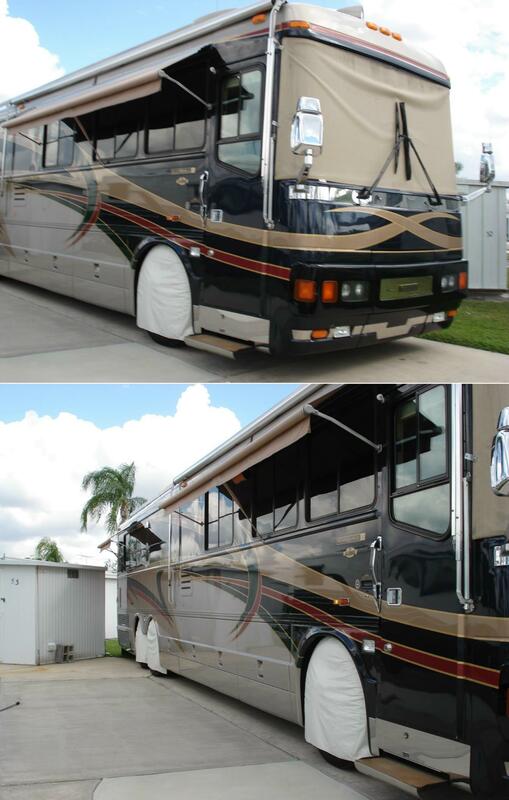 This custom ordered coach has the bedroom suite floor plan. Carpet front and rear has been replaced and sofa re-upholstered. New Michelin 315 80 tires in Aug 22, 2017. New engine batteries. New generator battery. Engine and generator just serviced and coach is ready to go. Just cleaned and interior just shampooed. 2000 LXI 43 Millennium Edition with living room-galley slide. Coach has approximately 74000 miles with 1799 engine hours. 500 HP Series 60 Detroit with three stage Jacobs engine brake and Allison Six speed World transmission. 15KW Power Tech generator with auto start has 2802 hours. EXTERIOR colors are dark blue, black, and tan over platinum base with red, hunter green and gold accent striping. Remote controlled chrome heated review mirrors, stainless steel package, power lift antenna, and Corian entrance steps with brass handles and brass trim. INTERIOR has living room-galley slide, brass toe kicks throughout, special tiered infinity design ceiling panels with mirrored inserts in living room and bed room. Interior colors are off white, beige and brown. Corian counter and table tops with drip less edging and tiered bull nosing with brass inlay. Six way power ISRI air ride pilot seat and co-pilot seat are covered in beige ultra leather. Lower dash is ultra leather. Upper dash is black Vitricor. Detroit engine Pro-driver, 10 disc CD changer, Bose surround sound, Trac-Vision in-motion satellite system, and electric windshield shades. Beige laminate cabinetry with red and navy inlay. LIVING ROOM has reupholstered fabric sleeper sofa with Corian top end table, blue ultra-leather Ekrones recliner with ottoman, Corian topped companion table (also serves as computer desk), overhead 20" TV, recessed down spotter lighting, special d'cor lights, special wall paper, sculptured carpet, solid surface window sills and boxing. Windows have special with coordinated valances with infinity shades. KITCHEN has Corian counter with brass pulls, molded Corian double bowl sink, brass Grohe faucet with brass Konstant hot, beveled mirror strips backsplash, acrylic wall divider, white front micro-convection oven, Norcold four door refrigerator with ice-maker, two burner electric range with ceramic cook top, and pull out pantries. Dining area has round front stemware cabinet, Corian topped dinette extension table with two chairs, kitchen style overhead cabinet and wall with beveled mirror strips. Tile flooring in kitchen, hall way, and bath areas. SPECIAL OPEN BATH has Corian topped sink, sit down dressing vanity, mirrored door medicine cabinets, washer-dryer combo in double door cabinet, round front shower, and two double mirrored door wardrobes with drawer storage located across from shower and private toilet. Private toilet has lavatory, window, and mirrored medicine cabinet. BEDROOM has laminate cabinetry, queen island bed with under bed storage, overhead cabinet, night stands, bedspread with coordinated window treatments, infinity shades, built in 20" TV atop double door storage, and carpeting. GENERAL This coach is loaded with special options including, steerable tag axle, Detroit engine Pro-driver, Steer Safe, computerized automatic HWH leveling jacks, roof rack and walk plate, keyless entry, security safe, air dump valves, air hose reel, power cord reel, cargo bay water cabinet, Joey bed in pass through compartment, aux. air compressor, two 3000 watt Trace inverters, Aqua Hot heat system, stereo in dash and in bedroom, altimeter, rear view monitor, three ducted roof AC units with heat strips, slide out tool box, and more. Michelin 315.80R tires. This no pet, non-smoker coach is in good condition. Call 217-826-8907 for details.